Bishop Daniel E. Flores, Archbishop José H. Gomez, Cardinal Daniel N. DiNardo, Bishop Joseph C. Bambera and Bishop Robert J. Brennan sit for a press conference on Monday, July 2, 2018, at the National Shrine at the Eugene De Mazenod Renewal Center in San Juan. Bishops from across the country — including the president and vice president of the U.S. Conference of Catholic Bishops — gathered in the Rio Grande Valley on Sunday and Monday to see firsthand the experience of children and parents who have recently migrated to the United States. On Sunday, the delegation visited the Humanitarian Respite Center on Sunday in McAllen, a facility offering temporary refuge to recently processed immigrants, then, on Monday, visited a detention center. The bishops were clear to point out immigrants were well cared for, and didn’t vilify local individuals involved in apprehension and care, but instead came with a message of family unification. They emphasized that there was a level of trauma inflicted in policy that separated children and parents. The United States could be both a nation of laws and compassion, and emphasized that it is a country of immigrants, they said. Flores said that the visit “signifies concern at the highest level” of the Conference of Bishops. He also acknowledged the while the government is attempting to reunify separated families, he hopes the visit will keep pressure up. Cardinal Daniel N. DiNardo, archbishop of Galveston-Houston and president of the USCCB, called for immigration reform, and for people to write and call their elected officials. The group called for a more humane approach to immigration and rhetoric. They emphasized that they’re all ready work to educate Catholics and others about the issue of immigration. And the brothers shouldn’t just be seen as religious leaders, but men “participating in the same humanity … trying to find a solution to this situation,” said Archbishop José H. Gomez, archbishop of Los Angeles and vice President of the USCCB. Talking to the parents and children on their visit to the detention center and shelter — people whose lives were at stake when deciding to leave their countries — put a face to the immigration issue, they said. DiNardo spoke of an immigrant who fled Honduras because he and his 16-year-old son were threatened with death. Flores said he’d talked to mothers in Central America that face difficult choices to keep their families safe. And wasn’t sure if the message is getting out of how dire it is in parts of Central America — where some face the prospect of joining a ganging or dying. Talking about the reason and addressing why people flee their countries is crucial to the church and the country, they said. And helping bring stability to Central American countries would make it less likely people would immigrate, said DiNardo. 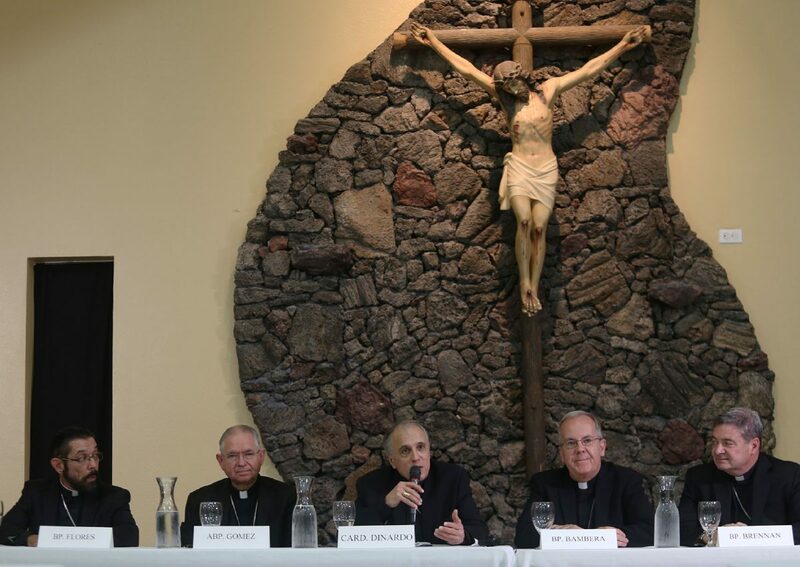 Catholic leaders’ pilgrimage to the United States-Mexico border was distinct because it was led by the DiNardo, who heads the organization presenting all American bishops, said Kevin Appleby, director of policy with the Center for Migration Studies. “That happens only certain circumstances, when they’re really a heightened sense of injustice going on at the border,” Appleby said. “It’s a teaching moment for the bishops. When one has the opportunity to talk to families, partisan politics disappear, said Bishop Joseph C. Bambera, bishop of the Diocese of Scranton. Flores said that people’s perspectives change when you hear stories firsthand, but the bishops acknowledged that everyone has the means and opportunity to tour facilities or speak to families first hand. Part of the mission is for the visiting leaders to spread the word of the reality on the ground, they said. “We want to bishops to go back to their home dioceses to report what they’ve seen,” Flores said.